In its essence Christianity is a life which men and women seek to live as members of community in the midst of the realities of existence in the world, on the basis of faith. The faith gives each member of the community and the community itself a character, with the inner strength, which they need in their everyday life and a hope for the future. Christianity believes that the faith, which holds, can offer a direction in life for men and women everywhere and in every generation. This is why the Church feels obliged to carry on its missionary activities in the world. Ever since its founding in the first century of the Christian era, Christianity spread in the world incorporating in to its adherence individual men and women as well as human communities belonging to various cultures, intellectual backgrounds and social conditions.In fact, it is in the setting of the Greco – Roman civilization and culture of those ancient times, including their intellectual and spiritual thought forms and heritage, that Christianity acquired its historical character. In this way they're developed two great ecclesiastical traditions. One of them consists in the Roman Catholic Church within its Western Latin outlook and mentality,from which the churches of the Protestant reformation broke off since the sixteenth century. The other comprises the eastern churches,which have inherited the legacy of the Greek culture and civilization mingled with the Hebrew religious heritage. This latter form of Christianity expanded to several Eastern people and adopt the name `ORTHODOX', while the first tradition prefers to be called as `CATHOLIC'. We shall discuss one point and its implications referring to these Eastern Churches, without necessarily implying that the emphases contained in them are possible to be found in varying degrees in the Western Churches also, whether Catholic or Protestant. It should also be made clear that we do not mean to suggest that the Eastern Churches agree in all the things , or that the Syrian Orthodox Church of India should conform to the traditions of any one or more of the other Eastern Churches in order to be Orthodox. Infact, the claim of autonomy which we make for our Church on the strength of its apostolic founding has no real meaning unless we develop a character our own. The central issue discussed in this paper is, in fact, how as a Church we can and should develop that character. Orthodoxy is primarily a community, which has inherited the Christian faith as the raison de etra of its existence in the world. In order to have the faith made a dynamic reality in the lives of its members one of the important means adopted by Orthodoxy is its worship. Infact, in Orthodox worship, liturgy and theology are so combined that the latter is made part of the devotional life of the people throughout the former. This fact may be illustrated by referring to four ideas repeatedly noted in Orthodox worship. The worship invariably begins and ends with the Trinitarian affirmation of God's nature. It begins in the name of the Father and of the Son and of the Holy Spirit, and it ends with the Trinitarian benediction. Besides, God the Holy Trinity is remembered and invoked or glorified on various occasions in the course of the worship itself. This repeated remembrance of the Holy Trinity should, whatever it may imply otherwise, enable the people to commit their lives to God, who included in Himself the foundation of fatherhood, sonship and the love that binds them together. In this way the Trinitarian understanding of God's nature would lead us to realise our task in building up our human community. Created in the image of God, amen reflect His Creator and grow into His perfection, and this is to be accomplished in a community. Orthodox worship is Christ-centered. God the eternal son has redeemed us by His incarnation making His saving grace available to us through His death and resurrection. We are called upon to receive this grace in faith, both spiritually and sacramentaly and lead life worthy or our calling. Here the doctrine of incarnation is taken seriously and, like the doctrine of the Holy Trinity, its value for everyday living is proclaimed. Orthodox worship recognised the fact in the historical realm man needs salvation, which has been given to us by God in His eternal son throughout the death and resurrection endured in His incarnation. There is no worship in Orthodoxy, which does not include `the Communion of Saints'. Saints on earth and saints who have gone behind the veil are commemorated, praying to God to them and asking for their prayers. By so doing, it is the reality of the Churches fullness, in which the local congregations is a part, that is brought to the mind of the worshipping the congregation for their contemplation. Through his death and resurrection Jesus Christ has brought in to being in His own Person, a new human community, in which the entire human race is expected to participate. 4. In the context of these ideas. Orthodox worships presents our life on earth, its need and problems to the Triune God.Prayers are offered to God, asking for His blessings all that we do and beseeching Him to direct our steps so long as we leave in this transitory world. Those in sickness or any kind or human trouble as well as those who have fallen in evil ways are remembered. So also the wider community with rulers and leaders as well as the world of nature are committed to God's care and protection. Orthodox worship is thus aimed to strengthen the community in the faith, inorder that the community as a whole and its members individually may become confirmed in the Christian calling and character. Orthodoxy as hierarchy comprising the three orders of bishop, Presbyter or Priest and Deacon, who place lives primarily in leading the worship. The rank of the Bishop included the various dignities of Patriarch or Catholicose, Archbishop or Metropolitan and Bishop or Episcopa. If any one of these dignitaries be present at a worship service, he is defacto its leader. Normally, it is the Priest who leads the worship. Deacons assist the Bishop and the Priest in the fulfillment of their functions. The hierarchy is thus in the community, with the special responsibility of building it up. As leader of worship the various orders of the hierarchy have the responsibility also of teaching and preaching. Worship by itself is not sufficient to educate the community in the faith and in its implications. Teaching and preaching are also equally important from this point of view. Orthodox worship and Orthodox religious education do, in fact, go together. They aim at leading the community to grow in to the likeness of Christ Himself through the Holy Spirit on the one hand, and to be a servant community the world on the other. Christians are called to be the `salt of the earth', in the sense of maintaining of quality of life which the world cannot afford to ignore or lose. In conserving this quality of life and in wowing it forth in the world, the hierarchy as a preeminent role to play. The basis of the hierarchies' appointment leadership in the Church is the commission of our Lord to the Apostles – `As the Father has sent to me even so I sent you'. Taking this commission seriously, we can say that the members of the hierarchy should make themselves servants in the three ways. They should, in the first place, be servants of Jesus Christ. We live in a world full of tensions of various kinds. These are their even in the Church itself. In the face of this hard reality, the world craves for the message of the love and reconciliation, which Jesus Christ has brought to us, and it is the Church lead by the hierarchy that should give it both to its members and to the world outside. Secondly, they should be servants of the community over which they have been appointed leaders. It is a fact that a large section of the Christian community does not really know of a quality of life, which is different from what they see in the world around them. They should be helped with this knowledge. Thirdly, the members of hierarchy are also servants of the wider community, whether it be Orthodox or non-Orthodox, or Christian or non-Christian. In this third area of service the hierarchy should have with them their communities. In this way the Christian community as whole will be a servant community. This is indeed a very difficult task to carry out. Infact, the Christian way promises victory only after the Cross. St.Thomas the Apostle, whose mission we celebrate at the Master Himself would expect this of us. What is difficult for man is not so far God. If Orthodoxy is basically a community, its attitude towards renewal deserves some discussion. Many people both within the Church and outside think that Orthodox consists merely in keeping to existing customs and practices, without permitting any change whatsoever. In fact a good friend of mine told me recently that Orthodoxy meant for him the maintenance of the prevailing ethos of the community. The word `Orthodox' as it is usually taken to mean may suggest this concept. But if this were the truth, Orthodoxy would lead to archaism, and the character of Orthodoxy as a living community with a message for the moral and spiritual progress of men every where and in every time would be lost. If Orthodoxy is to be meaningful and relevant, it should become contemporary, and this would be possible only when change and growth take place. What we mean here may be explained further. If Orthodox worship and religious education are meant to build up the community in the faith and to help the Church in the fulfillment of its Christian task in the world, the worship and the religious education which Orthodoxy maintains should be such that they will serve the purpose effectively. The same way customes and practices which are in vogue in the Church, whether they are noted in the accepted Canon Laws or not, so long as they are not based fundamentally on some principle of the faith, if they are found to create unavoidable hindrance and problems in the lives of its members, the Church should take them up for a fresh evaluation and appropriate modification. This can be done, however, only by drawing a distinction between what is essential and what is not essential. In judging, a custom or practice too indispensable or changeable, the criterion should be its relation the Churches' norms of the faith. As a community living in the world the Church has customs and practices accumulated over the centuries. Many of them may have had justifications at some time in the Church's history, but have lost them in course of time, some others may have been developed in the light of a distorted interpretation of certain basic principles. Costumes of these two kinds cannot be regarded as binding on the Church. Therefore, if they are found to offer moral or spiritual obstacles in the lives of any section in the Church, it is the moral responsibility of the Church to change them. In performing this duty the hierarchy, particularly those of the rank of the Bishops, has a significant role to play. As the leaders of the community they should be sensitive to the problems which the clergy and the members are facing, and they should take the initiative in offering solutions to them. As we have noted above, the Orthodox Churches of the East received the historical character against the intellectual and spiritual background of ancient Greeko-Judaic situation. During the first four centuries this eastern form of Christianity was extended to various peoples of Asia, Europe and Africa. In this way their came to be established the Churches of Syria and the Orient, Egypt, the Mainland of Greece, Armenia, Ethiopia and our own Indian Sub continent. Among these Eastern Churches, our church is in many ways an exception. The other Churches were able to receive each of them its own character within the geographical areas of their existence, even supplanting existing civilization and cultures. But our Church, at present, although we claim to have St.Thomas as our Apostle, as existed in India as a branch of the Syrian Church of the Middle east, all through this centuries, without ever feeling the need for a real confrontation with the great intellectual and spiritual tradition of India. Consequently we have not acquire an Indian character in the religious and spiritual spheres. We have all along been satisfied with our Indian Identity in this social, economic and political life only. India , as is well known to nay one, has a religious and philosophical heritage as profound as, if not profounder than, that of Greece and Rome. But we have never made any contact or acquaintance with it. There is one reason why we have not produced a theologian or religious poet of the caliber of the many renowned figures who have adorned the Churches of the Orient. In fact, it was through the labors of such men that the Syrian, Coptic, Greek, Armenian, Roman, and Ethiopian Churches had, each of them been able to develop centuries ago theological and liturgical traditions for itself, on the basis of a common foundation inherited from early times. In this way each of these Churches acquired its own ecclesiastical character in relation to, but not depending upon, the other Churches. We, on the contrary, have never developed one of this. By autonomy and the autocephalous status we have meant only a kind of administrative independence. The two reasons can be adduced for this plight of ours. In the first place, till recently we have been isolated group of Christians, with no intimate contact with the Eastern or Western world. Our knowledge of Orthodoxy had consisted of a kind of smattering acquaintance with the Syrian tradition gained through our limited relation with the Patriarch of Antioch. Since a study of theology, history and other related subjects in depth has somehow never attracted our attention, our knowledge of ultimate questions had been confined to what the Syrian people arrived here intermitedly and had told us, and we ourselves never undertook an investigation of such issues. We have received a great deal of the Syrian liturgical texts, some of which we use in our worship without knowing the meaning of it. In fact, as an autonomous Church what we really needed was a clear grasp of the common Eastern Orthodox tradition in theology, liturgy, and so on, in order that on its basis we could work for an indigenous Indian identity. This, however, escaped our thinking and we continued in our deeply influenced by the Roman Catholic and Antiochene Churches, without realising these facts. On this account we have often taken purely Roman Catholic ideas and emphases for the teaching of Orthodox Church. In saying all this we do not all imply any idea of downgrading the Syrian or Roman traditions. On the contrary, against the background of a serious study of the Syrian fathers and of a fair amount of knowledge of other eastern traditions, we can say the very precisely that the former are in no way inferior to the latter. The point made here is only that the Syrian traditions constitutes only one among more than five respectable eastern traditions, and that we as an autonomous Christian community in India cannot feel gratified about the greatness of the Syrian heritage. While claiming an apostolic founding for our Church, we should seek to find equally an Indian ecclesiastical identity for our Church. What is meant here should be further clarified. In preferring to the other Eastern Churches, we noted that each of them acquired its own character and theological and liturgical traditions, and that we should also work for evolving an Indian character and identity. The point we aim at may be stated by distinguishing the theological tradition from the liturgical tradition. In theology, for instance, the Orthodox Churches of the East have received on the whole a common basic tradition. This tradition needs to be explained to every generation in its own language and thought-forms, facing questions and problems raised by it. When this is done with a view to build up the community in the faith, there is bound to be growth in theological thinking, and I believe that if an Indian Christian theologian is able to confront the religious tradition of India, he would be led to interpret the Christian faith in a way that would contain a contribution towards the development of an Indian Christina theology. This precisely what the fathers of the Eastern Church, notably those of the Alexandrine School and there successors, had done with the intellectual and spiritual heritage of Greece in ancient times. The question of liturgical tradition is also similar in many ways. It is not necessary for us to give up the Syrian liturgical forms which we have taken over. But we should select from them whatever is useful and intelligible to us in the present century Indian situation for the maintenance of an intelligent worship. To this, we should make suitable additions of our own making. It should be admitted that the production of literary materials for liturgical worship is not an easy task, and that only persons can undertake it with a natural gift for it. At the same time, without proper encouragement, such development cannot take place. An expert committee should carefully scrutinize whatever is produced in this way and officially approved by the Holy Synod of the Church before it is given for use in public worship. If this task is handled responsibly with a knowledge of the spiritual and theological traditions of Orthodoxy in general on the one hand and our Indian back ground in life on the other; our Church will be able to have a liturgical tradition of its own, a tradition which is Indian and which at the same time includes all the basic elements of Orthodox liturgies anywhere else in the world. As we celebrate the nineteen hundredth anniversary of St.Thomas the Apostle, we can on no account neglect this duty and claim to be an autonomous and autocephalus body within Eastern Orthodoxy. In this connection a word should be said about our ecumenical task in India. It is a fact that there are various ecclesiastical traditions, both Eastern and Western in our country. 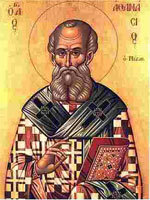 As the Apostle of India St.Thomas is the spiritual father of all of them, and as such they all are brethren. We should be able to seek and find them, so that they and we are found together in the ONE CHURCH of India. This is the vision which we should see, in the light of which we should enter in to a theological and spiritual dialogue with the other Churches in the years to come, with a view to gaining a closer understanding of them as they exist and function in the Indian context. This will require of us a spelling out of our positions on the one hand, and listening to what they have to say about themselves on the other. If we take up this responsibility with the seriousness it demands, we shall be lay to the foundation for the coming together of the different ecclesiastical traditions in our country and the eventual formation of the ONE CHURCH OF INDIA. The witness of Orthodoxy lies, in a word, in seeking to build up the community on the basis of the Christian faith. A visible Head on the historical plane does not govern this community. It has a hierarchy, which constitutes more liturgical and spiritual leaders than men endowed with the authority to rule. It can have local variations in liturgical practice and even in theological explanations. So long as there is agreement in essentials. The word `Orthodox' implies two ideas. In the first place, it prefers to the belief that these Churches call to the faith as our Lord through the Apostles has handed it down and as it has been maintained the Church under the guidance of the Holy Spirit. Secondly the faith does not lie in the intellectual realm of theological formulation only, but is also made real in life through the worship. The fact that our church was founded originally by St.Thomas, one of the Apostles of our Lord, does not give us any special credit. The coming St.Thomas to India indicates the bringing into our country of the Christian Church as a "Servant community". As we celebrate the nineteen hundredth anniversary of the Apostle, may God open our hearts and mind to see the many tasks that lie before us, and may He enable us to fulfill our responsibility in the years to come.